In my opinion, accessories definitely make any outfit. My new obsession this season, is Laura Wass’ WXYZ jewelry collection. The collection just launched for the Fall/Winter 2012 season, and I couldn’t be more thrilled. A talented artist, she draws inspiration from industrial design, science, and art, and designs her jewelry from repeated elements. In other words, she uses old materials and constructs them into something new. Her jewelry has a modern vibe, due to most of the metals used. Most of her jewelry is statement pieces, like her white or black chocker necklace from her Spring/Summer 2013 line. Her products range from $50-$1000. 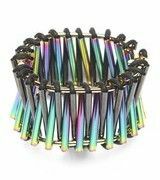 My favorite accessories of Wass’ are the products she finishes in what she calls “oil slick.” The bracelet on top of this article is finished in it, giving the metals an iridescent vibe. Wass says that she discovers the technique while on online forums for guns. Crazy, right? The finish is usually used to coat firearms. I mean, I’d much prefer the finish to be used on jewelry then guns any day. It’s safe to say that Wass has created unique pieces of jewelry that not many others will have, so if you want to be ahead of our time, go get em’! I am buying this ASAP!! Thanks for bringing this to my attention, its awesome! That is one beautiful piece of jewelry. Maybe I’ll get one for that special someone for Valentine’s Day!